A rake of the first order, Simon St. Maur spent his restless youth burning every bridge he crossed. When he inherits an earldom without a single penny attached to it, he sees a chance to start over—provided he can find an heiress to fund his efforts. But his wicked reputation means courtship will be difficult—until fate sends him the most notorious missing heiress in history. All he needs now is to make her into a lady and keep himself from making the only mistake that could ruin everything: falling in love. . .
Meredith Duran became an auto-buy author for me when I read her debut novel, The Duke of Shadows in 2008. With each book she writes, she continues to captivate and win me over. Nell Whitby has grown up in the slums of London's Bethnel Green, living a hand-to-mouth existence, rolling cigars in a crowded factory. When her mother is on her death bed she tells Nell that she is the daughter of the Earl of Rushden. Nell writes a letter to the earl asking for help for her dying mother, but she never hears from him. After her mother's death, Nell goes to Rushden's home planning to exact her revenge on him. But instead of finding her supposed father at the end of the gun she's wielding, Nell finds herself face to face with a tall, handsome and very naked stranger. He stepped forward into the square of moonlight. Her heart leapt into her throat and pounded like it wanted out. If this man was the work of the devil, it was a wonder more men didn't sell their sould. He was tall broad-shouldered, lean. Black hair. Full, hard lips. Mocking eyes. Naked as the day he'd been born. Simon St. Maur, the current Earl of Rushden never expected to find himself at the business end of a gun, especially one held by a young woman of questionable reputation. His surprise turns to utter astonishment when he realizes that the woman in question bears a startling resemblance to his predecessor's daughter, Kitty. If Simon is not mistaken, he is face to face with Cornelia Aubyn, the long lost daughter of the late Earl of Rushden. Being held at gunpoint aside, Simon views this as his lucky day. He may have inherited an earldom, but no money to go with it. Marrying an heiress would solve his financial problems, but marrying one of the heiresses of the late Earl of Rushden is a coup even he could never imagine. Simon strikes a bargain with Nell: he will teach her to be a proper lady and she will agree to marry him. But neither one imagined that their bargain may lead to love. Nell is a delightfully complex character: tough, but tender at the core; afraid to trust, yet longing for love and acceptance. She is thrilled at the prospect of having fine clothes, money and more food than she could imagine, but she feels somewhat unworthy and fearful that she will never belong in Simon's world. Simon may have been born with the proverbial silver spoon in his mouth, but he has almost as many issues and insecurities as Nell. Watching Simon and Nell being transformed by the wonder of love touched me in the deepest corners of my heart and reminded me of how beautifully Meredith Duran creates an emotionally intense love story. "And there are countless things you know that I don't," he said readily. "But we can learn from each other, Nell." She shook her head. He knew all the right things to say. That was the gift of his charm. This voice in her gut told her that his charm wasn't empty: he meant what he said. He meant it right now. But would he always? She turned back toward him, putting her face into his shirtfront, inhaling the scent of starch, the citrus of his cologne, the smell of his skin. She wanted so much to believe in him. It was an ache in her, this need to believe. His arms came around her and the feeling of them was beyond a miracle. Here was why God had made arms in the first place. Now she knew. It came to her that guarding her heart was a fool's errand. She'd already lost it. 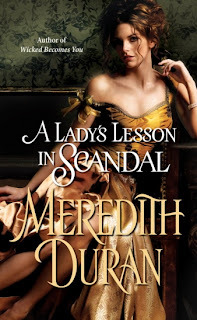 A Lady's Lesson in Scandal is historical romance at its finest, and Meredith Duran just gets better with every book that she writes. "A Lady's Lesson in Scandal" sounds just delicious. Wonderful review, Gannon! I'm going to order this book asap. I enjoyed her earlier book Wicked Becomes You. Great review Gannon! I've never read Meredith Duran befure, but have heard nothing but great things. Will have to check her out. Antonia, I hope you enjoy it! Laurie G, if you've read any of Meredith's other books you're sure to love this one. Lisa, you really should give her a try. Wow, Gannon! What a review! I've read a few Meredith Duran books before and (ducking head down here) I didn't really enjoy them. But, I will pick up ALLIS because of your review and read it. I like how the hero tells Nell they can learn things from each other. An honest and open hero is Simon, huh?! Oh yummy! This book sounds just delicious! Can't wait to read it. On my list right now! Deb, you don't have to duck your head. LOL I do hope if you read ALLIS that you enjoy it. Simon is a special hero. Trisha, I think you'd enjoy Meredith's books. Great review, Gannon! I'm reading ALLIS now and loving it. PJ emailed me when she read The Duke of Shadows and said, "Read this. You'll love it." --or something like that. :) I did, on both counts, and I've been a Duran fan ever since. Janga, I remember PJ and I both gushing about The Duke of Shadows. I'm so glad you're enjoying ALLIS. Terrific review, Gannon! I will be picking this one up! great review! I will keep a lookout for this!! Wow, Gannon, this sounds like a REALLY great book! I love A Lady's Lesson in Scandal already. Adding to my wish list. Thanks for the great review. Nell and Simon sound like a great couple who will keep the reader entertained. Andrea, I know you'll love this one! Karyn, I hope you get a chance to read it. Nell and Simon sound like a great couple who will keep the reader entertained.